When deciding to give your home’s interior or exterior a fresh look, you as a budget-minded property owner are likely to consider painting. Cost per square foot is low, making a fresh coat an affordable way to give your home a facelift, increase curb appeal and add value to the property. When calculating the painting cost per square foot, consider the price of paint and materials for a DIY job; if you plan to hire a professional, add in the labor cost as well. When you paint your home yourself, you can calculate the cost of paint and utilize the result to figure out your painting cost per square foot. Depending on the type of paint you choose, paint and primer will cost anywhere from $15 to $60+ per gallon. Designer and low-VOC paints often cost more. 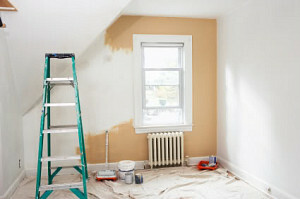 One gallon of paint will cover an average of 350 square feet. To calculate the number of gallons you will need, measure all surfaces to be painted. For example, a 10’ x 10’ room with an 8’ ceiling and four walls will be 10 x 8 x 4, or 320 square feet. Then subtract the dimensions of the windows and doors. So one gallon of paint will be more than enough to cover your 320 square feet of walls, minus doors and windows. Of course, you will need to multiply the figure by the number of coats you plan to use. Interior painting materials are relatively inexpensive and will not significantly increase the painting cost per square foot. You'll need: brushes, rollers, a paint pan, tape, drop cloths and a respirator or mask. Your paint brush supply should include a "cutter" for applying paint in corners and around trim. Be sure to protect trim and windows by taping along the edge to prevent having to clean paint splatters. A drop cloth will protect your floor covering. Always take off your shoes when leaving the painting area to keep from tracking wet paint around the house. A respirator or mask is particularly important if the area to be painted is not properly ventilated or you are not using low-VOC paint. The cost of the basic materials at most paint or hardware stores will cost between $30 and $50 for a home under 1,200 square feet. For larger jobs, paint sprayers can reduce the painting cost per square foot because they reduce the time required and generally reduce the amount of paint required for proper coverage. Sprayers are also a good choice for uneven or hard-to-reach locations, since paint can be easily sprayed into those areas. Due to the cost to purchase a sprayer, it is not an economical choice for smaller jobs that are just a room or two. Inexpensive personal-use models start around $60. Professional-quality sprayers cost around $450 and up. To calculate the total painting cost per square foot, add all the costs of paint and equipment. Then divide by the number of square feet for the entire project.